I made this sinful cake for our Anniversary. This is my second attempt making Tiramisu. The first time I didn't have all the right ingredients and I just used whatever I had in hand and it turn out a huge dissapointment in taste. 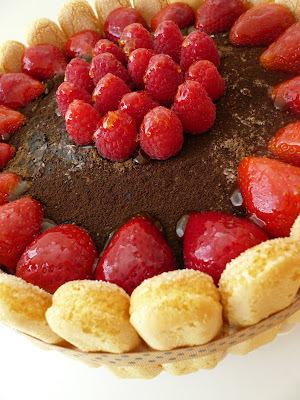 So this time I bought ladyfingers, mascarpone cheese, best cocoa powder, dark rum and heavy whipping cream. All I have to do is assemble the cake with all these ingredients and the taste is to die for. 1) In a mixing bowl whisk the whipping cream with 4 tbsp of sugar until firm peak. set aside. 4) Mix the coffee and dark rum. 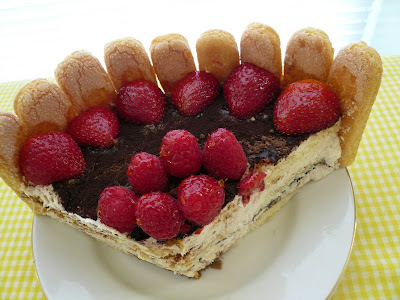 Dip lady fingers into coffee mixture and place in the bottom of the baking dish or spring form pan. 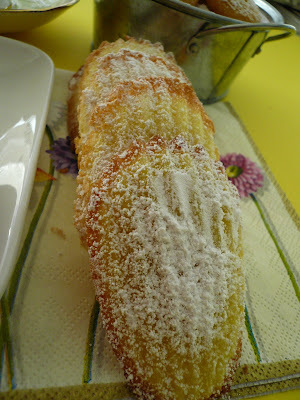 5) Spread some cream cheese mixture over the ladyfingers and dust with cocoa powder. 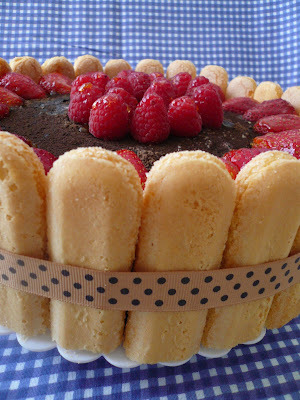 6) Dip some ladyfingers into coffee mixture and repeat step '5' again. 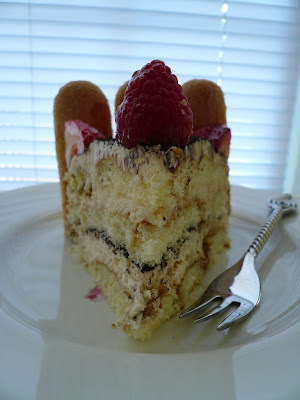 7) Cover and refrigerate tiramisu overnight. 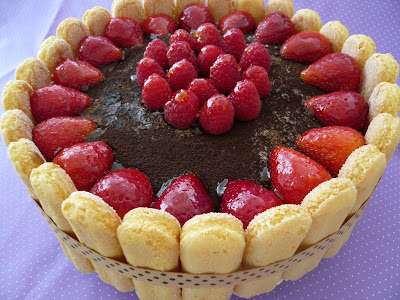 8) Just before serving decorate it with some cocoa powder or fresh fruits. More and more with every joy, for me is loving YOU. 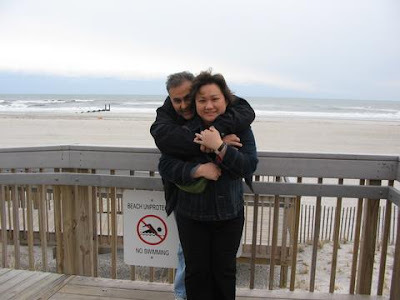 Happy Anniversary My Love !!! There are so many names out there for this kueh. Some call it Ban Chien Kueh, some call it 'Tai Gau-Meen' but we called it 'Chin Loong Pau'. This will be the kueh that I asked my sisters to bring me each time they come for a visit. There are two version of it. One thin and cripsy and the other one is thick and spongy. I remember buying this kueh every week at our Subang Jaya SS15 pasar malam and we will usually order it first before we walk around the pasar malam and come back to pick it up when we are done. There is always a very long line for this kueh. The filling is usually peanuts and sugar with a tiny dollop of butter but some might put sweet corn and coconut. Actually you can put any sweet fillings like red beans, sweet coconut, nutella, chocolate, kaya to your apam balik. I read somewhere that people even put cream cheese and minced meat to their Apam Balik. I wouldn't go that far :). I like mine the old fashion way. Nuts and sugar. 1) In a large bowl add in all ingredients for batter. Mix ingredients well into smooth batter. Set aside in the fridge for 2 hours. 2) Heat up a non-stick pan and very lightly grease it with a bit of oil. Clean off any access oil with a paper towel. 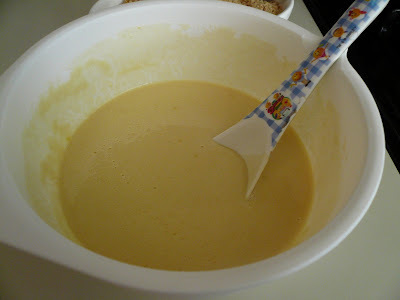 3) Pour a ladle full of batter into the pan and swirl the pan is full cover with batter. Put more batter if you want a thicker pancake. 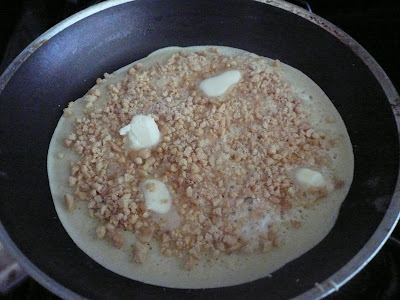 4) Sprinkle some peanuts, sugar and a few dollop of butter then put a cover over it. 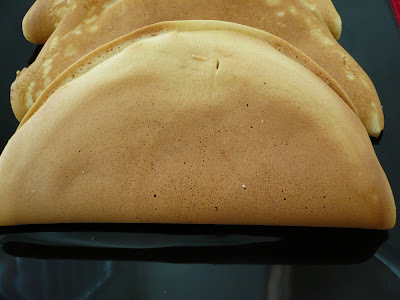 5) Cook until the centre of the pancake is cooked and the edges brown. 6) Remove and fold into half. Note : I didn't put any alkaline water to my batter since I don't have it. I like my apam balik crispy so I cook it over medium heat and I don't even need to cover the pan when I cook it. Anyway, since I don't have a whole fish I cook this dish with fish fillets. 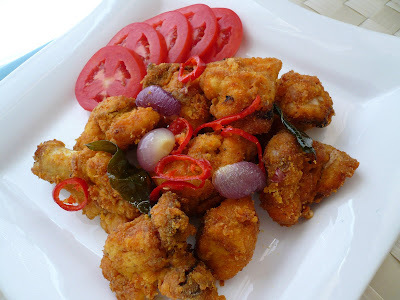 Mix all the above ingredient together and deep fried fish until golden brown. Drain on a paper towels. Heat up wok with 1 tbsp of oil. Saute the onions & ginger until lightly brown. Add in all the vegetables and stir fry for 1 min. Add in sauce and cook until thicken. Toss in the fried fish and toss it gently until the fish is well coated with sauce. Turn off the heat and dish out. Serve with warm rice. Note : If you want sweeter or tangy sauce you can add more sugar or vinegar. I was first introduced to tempe by my classmate Pau Pin many years ago. She will fried it first and then cook it with sambal. From then on I am hooked. 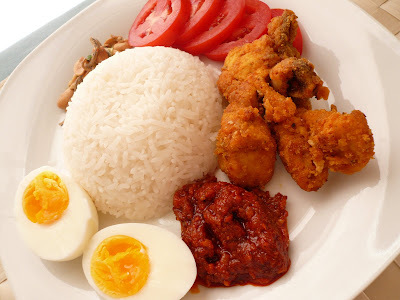 Back in Malaysia I will never cook this dish because I can buy it from any mak cik stall for lunch. Is normally fried with ikan bilis and also potatoes. Well, no mak cik stall here so I have to cook it myself. I am glad that I am able to get a few varieties of tempe here at Wegman's. They sell soy bean , whole grains and also wild rice tempe. I tried them all but I still like the soy bean one better. I got this tempe recipe from Jun's blog. This is her recipe. 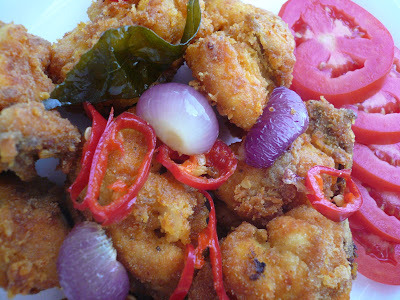 1) Fried the tempe and ikan bilis and set aside. 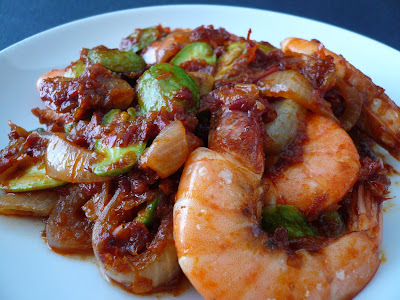 2) Stir fry the blended ingredients or sambal paste until fragrant and add in the chili and onion. Fry for a few min. 3) Add in the dark soy sauce, brown sugar and stir fry for a few second. 4) Lastly add in the tempe and ikan bilis. Stir well and dish out. 5) Serve with warm rice. Note : Instead of the blended ingredient I just add a tablespoon of my homemade sambal. 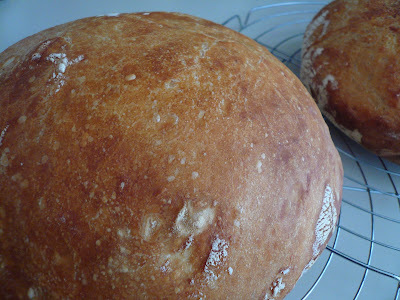 Baked a few loaves of No-Knead Bread over the weekend. Gave some to Nancy and Diana. 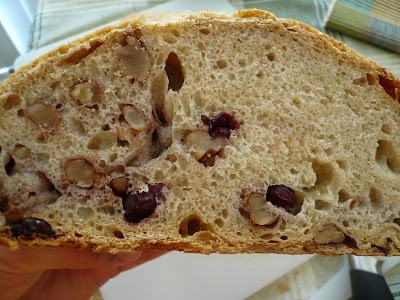 I made 2 loaves of white bread and two whole-wheat (one with walnuts and cranberries). 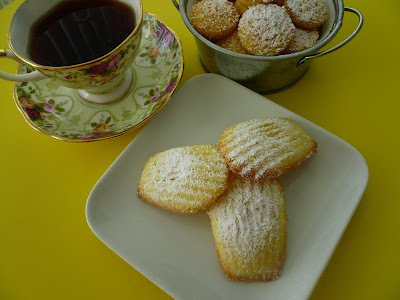 This little 'tea cakes' also known by many as Madeleines were created by the French in the 17th century by Madeleine Simonin. 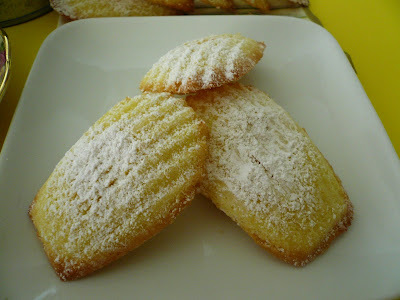 It said that the Cardinal was so pleased with the little cakes that he christened them Madeleines. This little cakes always been my favourite but is expensive to buy it. So I decided to make some for tea. Being a lemon lover, these little treats are hard to resists. There are plenty of madeleine recipes out there but most of them need to let the batter sit in the fridge overnight or at least an hour before baking them. For this recipe you can bake it right away. 1) Pre-heat over to 375 F, Butter and lightly flour the Madeleine pan. 3) Add in vanilla and lemon zest, then the flour and salt. Beat until just combined. 4) In a low speed, pour in melted butter in a steady stream until incorporated. 5) Spoon batter into madeleine pan and bake for 8-10 minutes until its golden brown. 6) Turn over immediately onto cooling rack. 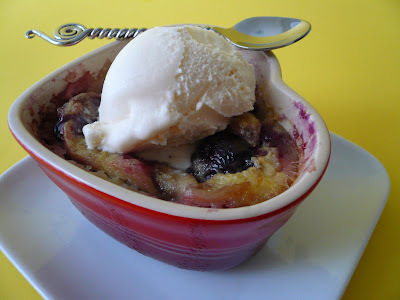 7) Dust with some confectioners sugar and serve. On Tuesday 15th day of the 8th lunar month Chinese all around the world will be celebration Mooncake Festival or Lantern Festival. This is the time where our family will gather around and have dinner and mooncakes and later in the evening my nieces and nephews will play with their lanterns. In my younger days I really looked forward to this festival where marks the start of unlimited mooncakes eating and lantern burning. I still remember my brothers used to make lanterns using Milo or condensed milk cans. Those were the days..... Now is all batteries-operated lanterns which comes in all kind of shape and cartoon characters. 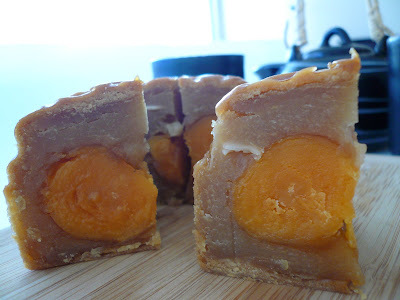 Years ago there are only have 3 kinds of mooncakes like red beans paste with pumpkin seeds, lotus paste and mixed nuts. Now there are so many kinds in the market with flavour like chocolate, durian, green tea, lychee, strawberry and etc. Being away from home for so many years I really missed our Malaysia Mooncakes. The one sold here are mostly from China and Hong Kong. I find it too sweet and taste funny. 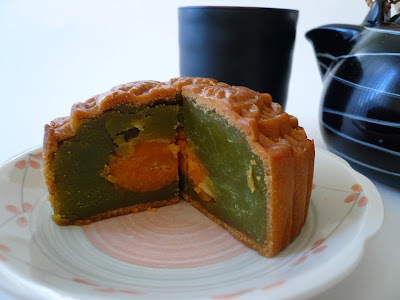 One of my favourite mooncakes is from Kam Lun Tai. Each year my sister-in-law will buy boxes and boxes of it to give away as gifts and in return we will received boxes and boxes of it too. I was so surprised yesterday when I saw UPS truck stopping in front of our house. I asked Carlos if he is expecting any package and he said 'no' and guess what. It is for me. I was so excited because is really heavy. 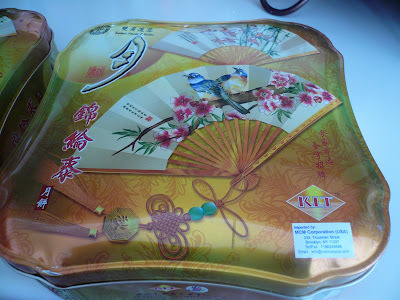 What can it be........ta ta.... is from TOA The management and Tauke Ray sent me 2 boxes of Kam Lun Tai Mooncakes. Thanks you Ray for the wonderful gifts. Now you can order our Malaysian mooncakes from TOA For all of you who like Malaysia Mooncakes do check out their website and beside mooncakes they have other products like Malaysian sauces and paste and snacks too. By the way their mooncakes is "Halal" so our Muslim friends can have it for berbuka puasa. I really love all kinds of soy bean products regardless its texture, shape or taste. One of them is Japanese tofu because of its silky smooth texture. Is just like eating 'tau foo far'. 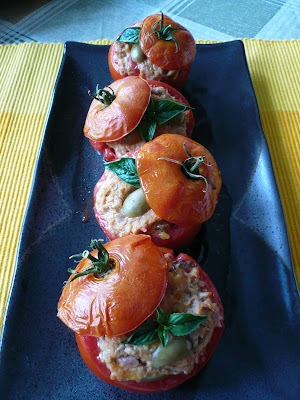 Here is a very simple recipe which is easy and fast to prepare and healthy too. 1) Cut tofu into 1" cube and steam for 5 min. Removed any water after steaming. 2) Mix all the seasoning ingredients together in a bowl. 3) Heat up wok with a bit of olive oil sauteed garlic and shallots until lightly brown. 4) Add in minced chicken and stir fry for 30 seconds. Add in the seasoning. 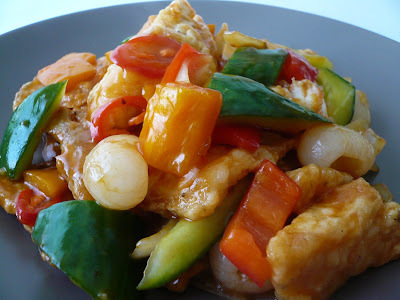 5) Stir fry until the sauce is thicken and chicken is cook. Add in chili. 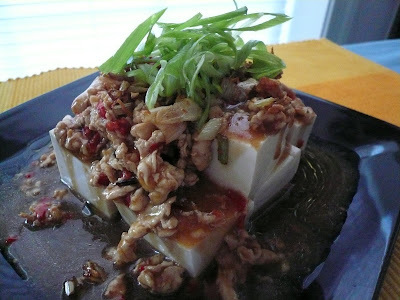 6) Dish out the chicken on top of the steamed tofu and garnish with spring onions. 7) Served with warm rice. It has been a while since I last make this kuih. The last time I made this was for our gathering in December 2006. 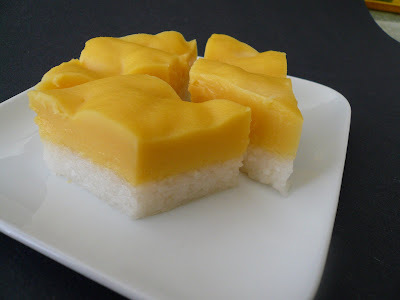 Is really an easy kuih to make. 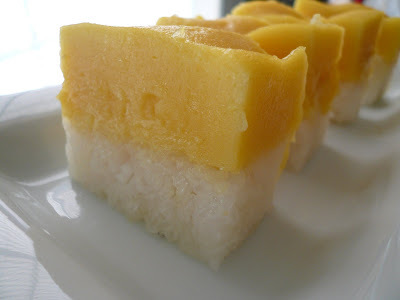 1) Drain the glutinous rice and mix it with coconut milk and salt. Put the mixture into the steaming tray and steam on high heat for 20 min. 2) Remove from heat fluff up the rice with a fork. Then used a piece of banana leaf or aluminium foil to press down the rice to level the surface. Set aside. 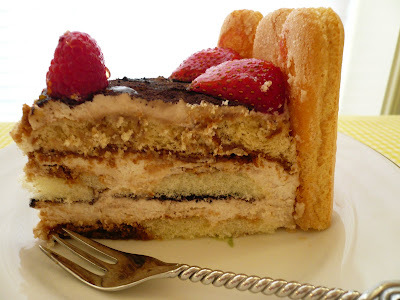 3) To make the top layer combine all ingredients until well mixed. Strain. 4) Return the rice to the steamer and pour in the top layer batter on top of the rice. 5) Steam on medium heat for another 35 minutes or until the top layer is cooked and firm to touch. 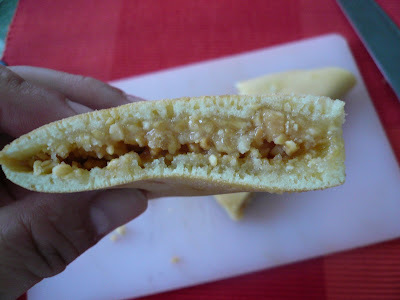 6) Remove and cool down the kueh before cutting into it. 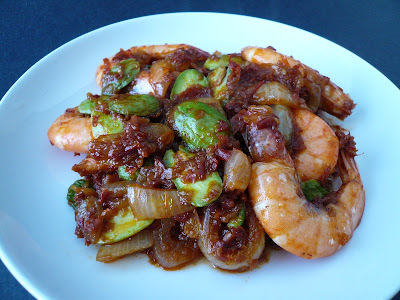 Zue gave me a few packets of petai the other day so I cooked it with some prawns. I used my homemade sambal to cook this dish. 1) Warm up frying pan and add in some oil. Stir fry onion and garlic until lightly brown. 2) Add in prawns and cook for 1 min. Add in petai and homemade sambal. 3) Cook for another 2 min and add in sugar and salt. 4) Serve with warm rice. Note : You can used any store bought sambal paste for this dish. Thank you Zue for the petai. I've been tagged again and this time by Beachlover. Here's how it works. Use the first letter of your name to answer each question. Must be real places, names..nothing made up. Can't use own name for boy/girl's name question. If you can't answer, skip it. 18. Reason for being late to work : Grandpa is sick. I won't tag anyone but if anyone is interested in doing it feel free to do so. 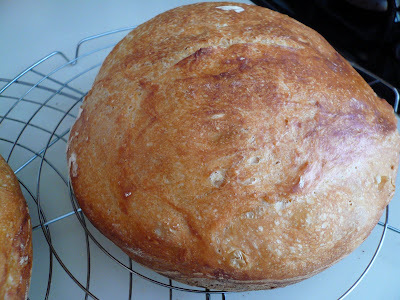 I read about this no-knead bread last year and every bloggers seems to be making it. 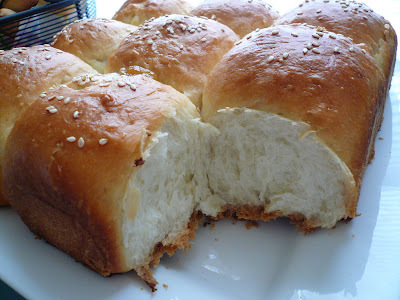 I am not good at making bread so I am not so keen of doing it until I saw the this bread again at Jaden's blog and even her 4 year old son able made this. 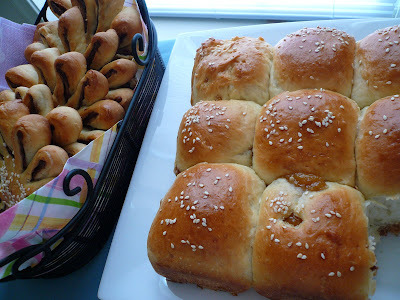 This bread is so easy to make and I encourage every bread lover to try it out. All you need to do is mixed all the ingredients and let it proof for 15-20 hours and hardly need any work at all. But you do need a heavy cast iron pan with a cover for baking the bread. I used my Le Crueset. 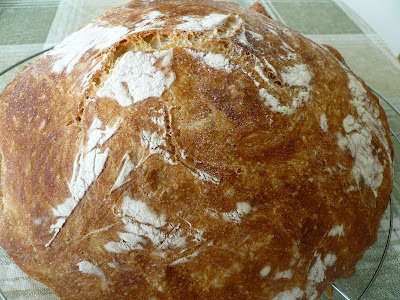 A baker name Jim Lahey, of Sullivan Street Bakery develop this recipe and is in New York time website. The bread is crusty on the outside and chewy on the inside. It's the best loaf of bread I've ever made. Is excellent to eat it with salad of just slab some butter on it. 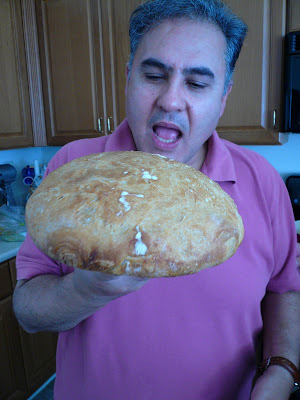 I will be making this bread again and this time maybe with different kind of flour, herbs, nuts and dried fruits. To those who make this bread do let me know how it turn out and the version you use or any kind of modification. 1) Mix all the above ingredients in a mixing bowl until it all comes together. 2) It should be wet and messy. 3) Cover with a plastic wrap and let it sit for 12-20 hours on the counter top. 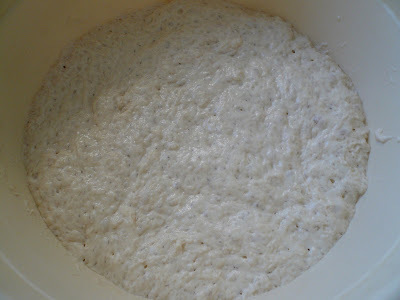 4) The next day the dough will be wet and bubbly. Dump the dough on a floured counter top. 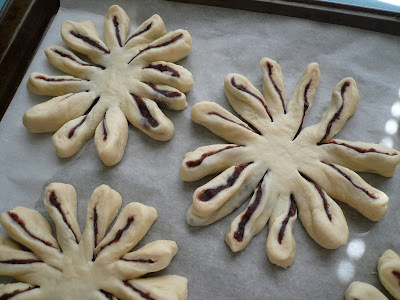 Fold the end of the dough a few times with your hand and dust your hand with some flour. 5) Dust a cotton towel generously with some flour. Set the dough seam side down on the towel, cover and let it proof for another 2 hours. 6) When you've got 1/2 an hour left, slip your heavy cast iron pot with cover into the oven and preheat to 450 F.
7) You dough should be double in size. 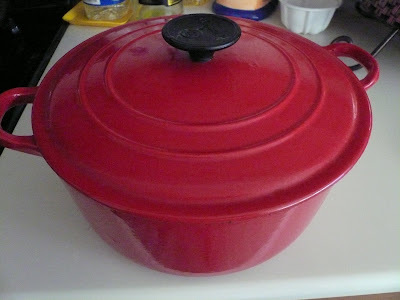 Remove pot from oven and holding the towel, dump the wobbly dough into the pot. 8) Cover and bake for 30 minutes. Then uncover and bake for another 15-20 minutes or until the crust is golden brown and the temperature in the middle of the loaf is around 210F. 9) Remove and cool on wire-rack. Note : You might need a little extra of water if the dough is too dry. The dough will be really sticky and wobbly. Don't worried about it. Is supposed to be that way. The orginal recipe call for the dough to be placed on a towel but I find it very sticky. The next time I will use the parchment paper. Please be careful when you remove the hot pan from the oven. Remember the bread don't have to be nice or perfect. It is supposed to be rustic loaf of bread. Resist the temptation of cutting into the bread. It must cool down for at least an hour before cutting into it. My tomato plants still giving me lots of tomatoes and normally we will just eat them fresh. But this evening I decided to bake with it. Here is a very simple recipe. 2) Place it on a baking dish. 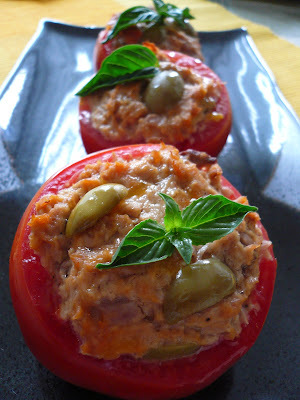 3) Mix all the rest of the ingredient well and spoon the tuna into the tomato shells. 4) Bake in a pre-heated 350 degree F oven for 20 min. 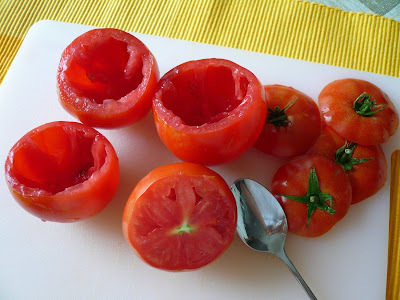 5) Serve warm or chilled. Note : I didn't add any salt to it because the tuna is salty. Some people might find it odd cooking curry with pumpkin but I like adding it into my curry. 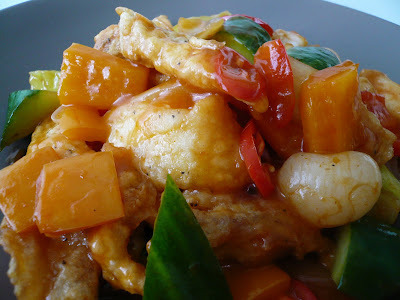 It gave the curry some sweetness and also balance out the spiciness of the dish. 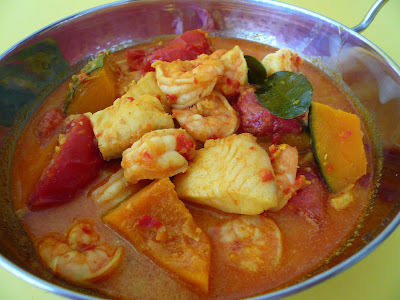 1) Blend all the curry paste ingredients with some water and set aside. 2) Heat up the frying pan with some oil and stir fry the blended curry paste. 3) Add in 2 tbsp of coconut and stir fry until fragrant. 4) Add in the rest of the coconut milk and bring to boil. Add in pumpkin and kaffir lime leaves and reduce heat to simmer. 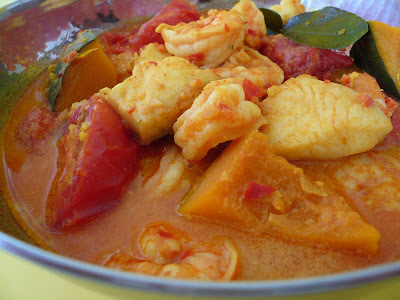 5) When the pumpkin is soft add the seafood and tomatoes. 6) Bring to boil and add in sugar, fish sauce and seasoning. Cook for 2 mins. 7) Serve with warm rice. These are the rules : Five answer to each question and then tagged five others. Instruction :-remove the first blog and then add you blog to the last. Q1. What were you doing 10 Years ago? 1. Working full time in an advertising company. Q2. What were you doing 1 Year ago? 3. Meeting some of MyB members for the 1st time. Q3. What are 5 snacks you enjoy? Q4. What are 5 songs you know the lyrics to? Q5. 5 things you would do if you are a Millionaire? 5. Invest the rest for old age. Q7. 5 things you like to do? Q9. 5 things you would never wear? Q10. 5 things you hate to do? There are so many version of fried chicken here but nothing taste good enough for me. I still like our mamak version with plenty of chilis and kunyit powder. I don't have a proper recipe for it so I did my own version. 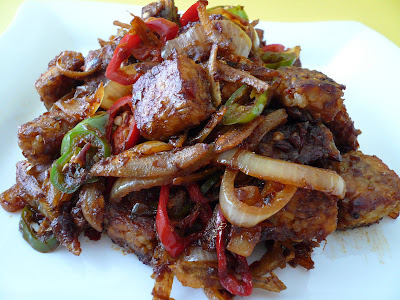 1) Marinate chicken with all the above ingredients except for rice flour, curry leaves and shallots for 2 hours. 2) Heat up oil and add the rice flour to the marinated chicken. Mix it well. 4) When the chicken is golden brown dish out and drain the oil on paper towel. 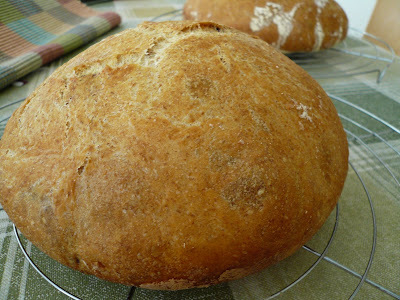 I don't make bread often as it is easily available from the supermarkets or bakeries. Our supermarket Wegman's here make really good bread. 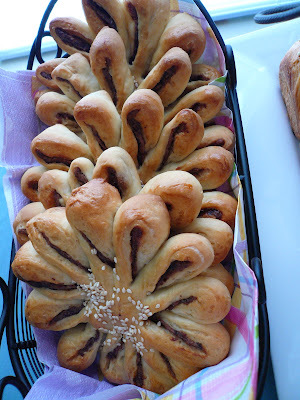 Since I have some kaya and red bean paste I decided to make some buns for Diana so she can warm it up and have it before going for her class. 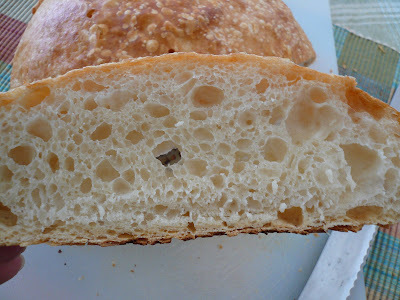 I am really happy with the results as the bread turn out really soft. 1) Put all the above ingredients except for butter in a mixer knead with a dough hook to form a dough on low speed. 2) Add in butter and continue to knead for another 5 min. 3) Place dough in a mixing bowl and cover with cling wrap and let it proof to double its size in a warm place. 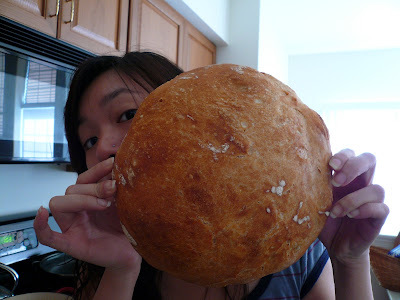 4) Punch down the dough and divide the dough in small portion about the size of a ping pong ball. 6) Let it rest for another 15 min. 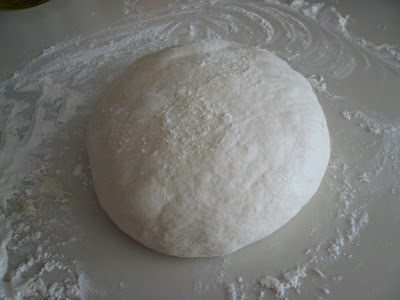 7) Shape dough into desired shape and put in fillings and let it proof again to double its size. 8) Glaze the buns with egg wash and bake in 350 degree F until golden brown. Note : You might need a bit more flour or liquid for this recipe. It all depend on your flour and the day temperature. You can put whatever fillings you desire.